Two piles of rubble: CMA is meeting with owner to decide on how to proceed. Crews worked through the night to get to this point. Blogfinger photo © 4/15/19. 10:00 am. Ocean Grove North End boardwalk. The fire site is quiet this morning. All fire fighting equipment is gone, and two Camp Meeting Associates observers are looking around before leaving in their truck. There is no police presence now. We did speak to those CMA workers, and they told Blogfinger that the CMA was conferring with the building’s owner, Bob Dweck, to come up with a short term plan. 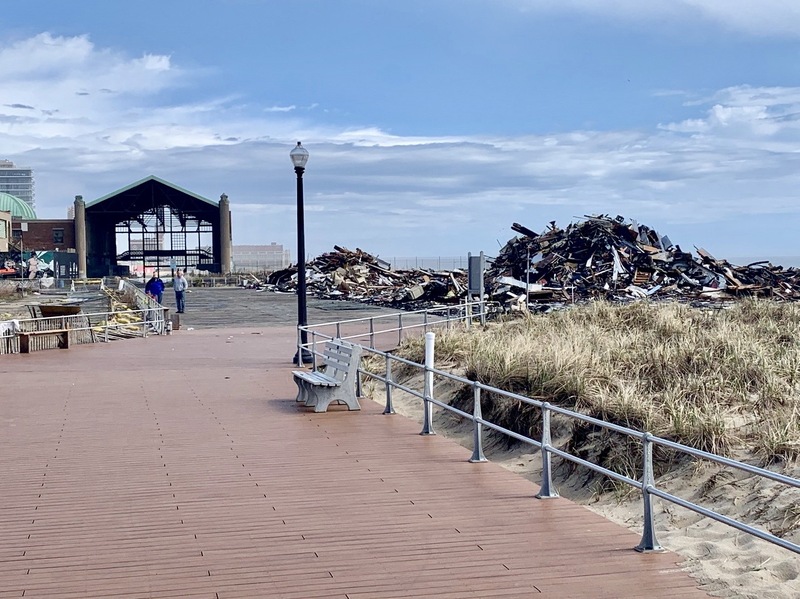 The owner is officially known as “Maplewood Ocean Grove Associates, Inc.” Neptune Township is not part of the management team currently planning the next steps. It reminds me of the post Sandy situation when the Township would not send any help east of Ocean Avenue because it is private property. It brings back the uncomfortable private vs. public issues that were raised in conjunction with FEMA funding. Undoubtedly the building is insured. The CMA “owns” the land, and that lot is part of the North End Revelopment Plan. The short term prognosis is that no one is being allowed at the site for now. All the rubble will be removed, and then a path will be created to enable pedestrians to go back and forth through the Casino. Despite early reports of “collapse” of the boardwalk at the site, we are told this morning that the boardwalk is fine. It is remarkable how quickly the site was transformed into what you see in the image above. Those who were responsible for that cleanup should be commended for turning that depressing burned wreck into a safe place for hope. In a way it seems like the dawning of a new day, because that stretch of beach will be open–a visual delight for all to enjoy, as the sun rises and sets over OG ‘s North End—pending subsequent plans, of course.